While Racing Metro's impressive win over Toulouse dominated the headlines from Friday night's action in the Top 14, the incident surrounding Florian Fritz in the first-half deserves equal press. Fritz clattered into Francois van der Merwe's knee in the 19th minute of the match and was left visibly shaken. With blood pouring down his face, he appeared dazed at best and staggered off the field. 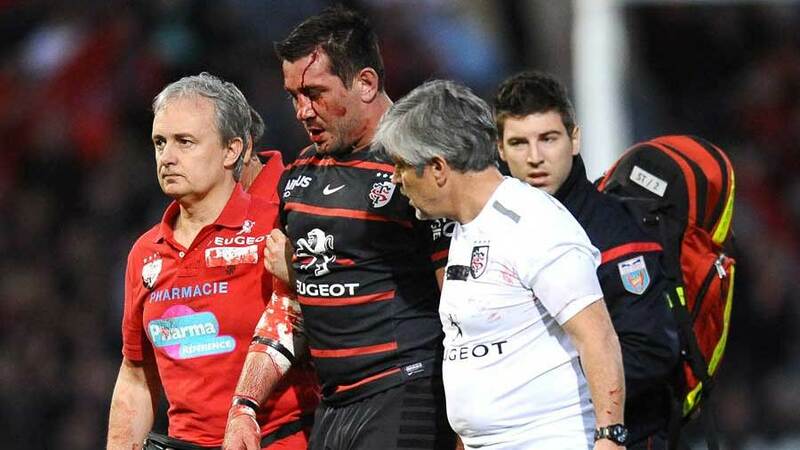 But despite the raised awareness surrounding the dangers of concussion and the protocols, Fritz returned to the field 16 minutes later with television cameras appearing to show Toulouse director of rugby Guy Noves agitating for the centre to return while he was receiving treatment from medics within the heart of Stade Ernest-Wallon. Fritz lasted a few more minutes and was then replaced at half-time by Gael Fickou. "I had a small KO. I don't remember everything," Fritz told Canal+. "It was better to leave a fresh guy like Gaël Fickou [replace him]." The incident received condemnation on Twitter from journalists and players. Professional boxers wouldn't be allowed to continue in the condition that Florian Fritz found himself. Let alone rugby players. Fritz #concussion incident from last night one of worst I have ever seen. Huge questions need asking of Noves and med staff. Shocking. A lot of concern being expressed about the Florian Fritz concussion protocol incident tonight.